2. Place the salmon on a greased baking tray. 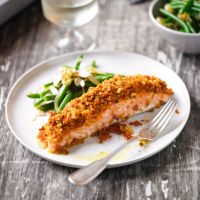 Make breadcrumbs with the bread using a food processor and mix with the pesto, press onto the salmon and bake for 15 minutes. 3. Meanwhile, heat the oil in a frying pan and fry the onion for 3 minutes, add the beans and almonds and fry for a further 3-4 minutes, season. Serve with the salmon.